Hot Dogs ahoy!! Grab one of these delicious dogs and feel like a weiner! Perfect for grabbing a quick snack on the go, this outlet offers a range of tasty hot dogs and soft drinks, with several picnic benches overlooking the lake and Battle Galleons. This long-standing venue has been the Towers' premiere source of Hot Dogs since it opened during the Merrie Engalnd years. When Mutiny Bay took over, the unit also became home to Pirates Pasty Co. as well as offering pancakes. 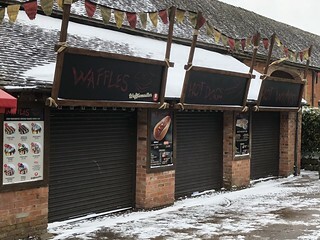 2018 sees a new menu for the unit - out go the pancakes and pasties, replaced by Waffles and Wraps.